If you’re distributing pamphlets and other printed information at your workspace, whether it’s an exhibition booth at an expo, trade show or conference, or at the lobby of your clinic or office, you need to keep them neat and organised in one place. It’s very important that you do so because it makes your space look clean and professional to your targeted audience, and it makes it easy for your customers to retrieve the information they want without having to dig for them. A portable brochure stand is exactly the item that will help you achieve this, and we have portable brochure stands that you can use for this purpose. Our portable brochure rack is a simple yet stylish accessory that you can proudly display at your exhibition booth or workspace lobby. Its modern, streamlined design allows it to blend easily with any decor. More than that, this brochure holder is a marriage of purpose and form – it can conveniently hold your printouts and, at the same time, serve as a decorative item for your space. 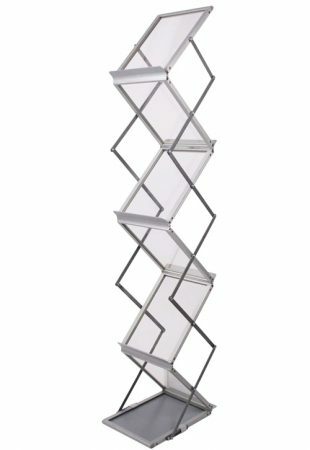 This free standing brochure or magazine rack has an aluminium frame, finished with silver so it attains its sleek and elegant appearance. The shelves are made of clear acrylic and can easily hold A4-and A5-sized documents. Most importantly, the entire rack is foldable. This means you can transport it and set it up wherever you want it without any fuss. You can use it at as frequently as you want and to any event you need it. This level of mileage and usability you’ll get from this portable brochure rack means you’ll save money in its purchase in the end. As mentioned earlier, this portable brochure stand can conveniently hold your printouts and serve as decoration for your space. It is also very easy to set up. All you need to do is to pull it up as you would an accordion and then click it locked into place. Setup time takes no time at all. Our portable brochure stands are the best pamphlet holders and magazine racks you’ll find in the market today. We deliver to any location in Australia, including Sydney, Melbourne, Perth, Adelaide, Gold Coast, Brisbane, Darwin and Canberra. Call us today for more information on this product.